In FATHOM, Lehr uses nature as a departure point, and with tangible materials, evokes the sublime in a creative process that mirrors nature itself. 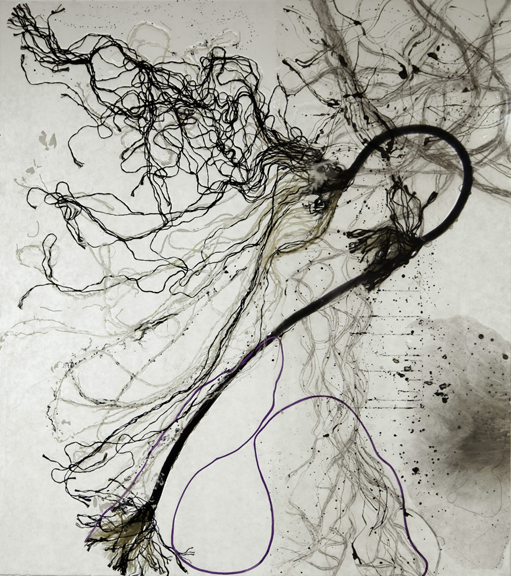 The tangles of rope and swaths of burnt paper function as objects as well as activated representations that evoke the dramatic sprawling roots of mangroves and the flowing tentacles of jellyfish. Lehr's work shares the mystique possessed by mangroves and the deep ocean, yet focuses on the intimate, creating a dynamic experience of movement that is simultaneously graceful and powerful. Mira Lehr was born in New York but has lived most of her life in Miami. She graduated from Vassar College and studied painting with Robert Motherwell, James Brooks, Roberto Juarez, and James and Nieves Billmyer (long time students of Hans Hofmann.) She participated with Buckminster Fuller on the first World Game Scenario Project at the New York Studio School. In 2008, Lehr’s oral history interview by Irving Sandler was included in the archives of the Getty Museum and Research Center in Los Angeles and the Smithsonian Museum of American Art in Washington D.C. She is also featured in the book “Miami Contemporary Artists” published by Schiffer Publishers in 2007 and was juried into the "New American Paintings Exhibition in Print" by Charlotta Kotik, curator of contemporary art at the Brooklyn Museum. In addition to numerous private and public collections, one of Lehr’s major works was recently purchased by Memorial Sloan-Kettering in New York for the lobby of their new Evelyn H. Lauder Breast Cancer Center and a major work was purchased for the permanent collection of the Miami Art Museum. Lehr was selected by the Art in Embassies program to exhibit her work in the American Embassy in Sofia, Bulgaria and in Mexico City. Laid In Earth is the second collaboration between Mira Lehr and Yara Travieso. Travieso is a director and award winning choreographer noted for her cinematic approach to multimedia productions and installations. Her recent full-length works were presented in Lincoln Center and Miami’s New World Symphony Center. Her video installation pieces have been presented in New Museum, various gallery spaces and reside in international collections.